Description: "Seadream" is the cornerstone of a group of new paintings with references to natural form in strong compositional movement and vibrant color. It's large and visually complex in texture and hue. 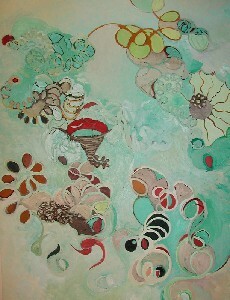 Fantastic sea inspired shapes rendered in dream like color give this painting its title. April Hankins received an MFA in painting from Yale University School of Art and a BFA from Massachusetts College of Art. Her works are in the collections of the Fogg Art Museum at Harvard, Pfizer, Inc., New York Public Library and Yale University Art Gallery, as well as private collections. My work may be said to have visual variety. The connecting thread is a pattern based on Fibonacci numbers. There are three influences to my work, but the first and strongest is that of Fibonacci numbers. To jog the memory, each Fibonacci number is calculated as the sum of the previous two, (i.e., 0, 1, 1, 2, 3, 5, 8 and so on). I was struck by the prevalence of the sequence in the research I did when drawing sea shells. Later, when working on a graphic involving phases of the moon, I found the sequence useful in illustrating the blossoming of an idea. Captivated by the sequence's beauty and adaptability, for painting I designed an abstract pattern by dividing a circle into eight pie-shaped parts, and set the parts -- or angles really, in a linear arrangement of ever increasing proportion as in the Fibonacci sequence. Reducing this diagram to a "short hand" of horizontal, vertical and diagonal lines created a versatile 12 element pattern that I have used ever since. Because of the pattern's profound mathematical beauty and meditative qualities I was compelled to use it. After prolonged experience I was able to recognize the pattern frequently out in the world and in unexpected places. Also, using it had prepared and created in me an affinity for the second influence to my work, Buddhist thangkas. The thangkas images are of strong color and chaotic movement reminding believers of cosmic realms behind and beyond our day-to-day reality. To express this notion in my paintings I disordered the grid, heightened color and painted curves and spirals naturally derived from Fibonacci numbers to jar composition and syncopate visual rhythms. In this expanded painting vocabulary images from the Tarot surfaced, the third influence to my work. As a card reader of many years I'm familiar with Tarot archetypes and the meanings as to relative psychological states. The images in my paintings, though seemingly abstract, reflect states of the Tarot's Major Arcana. The titles would come to mind upon completion of the paintings. There is an interesting parallel to my abstract pattern in the Tarot deck. Both have a set number of parts. The combination of the deck's cards or the pattern's parts relative to sequence and arrangement creates a story or an image unique to a context and time. The stories, as the images, are infinite in variety, yet all are created with a consistent set. My recent work has a stronger sense of physical movement and emotion. The visual rhythms are lyrical and the images echo natural forms. These paintings are made differently as what was before conscious, or even planned, is there now by second nature. The newer images and their meanings are spontaneous, built upon the foundation of earlier work and come from an opening up of process and inspiration.